I haven't stopped grinning for the past few hours. And inside his helmet, I'm sure Rishaad hasn't either. Both of us have been whizzing around on these little motorcycles all morning all over Mumbai, and we've been having a blast. They might be the littlest Hondas around, but I'm pretty sure that they are two of the most entertaining. Both of us have been up to all kinds of mischief all this while and not one person has looked at us with ill will. They've all just looked at us and gone "awwww". 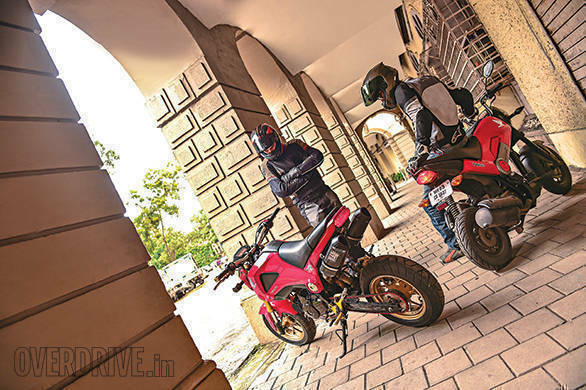 Such is the power of the Honda Grom (aka MSX 125) and India's Grom  the Navi. Ever since the 2016 Auto Expo, there has been a little voice in my head that went "Grom Grom Grom Grom Grom..." every time I saw a Navi. Having heard so much about the Grom and how much fun has been packed into the little package that it is, I could only feel jealous that they never sold the motorcycle here. When the Navi came around, the feeling was "if not that, at least this". But the Navi proved to be as much fun as what I had imagined the Grom to be. But the little voice inside my head refused to go away. But today is the day that I finally get it to shut up. The first thing that the little voice wanted to do was find out how similar they are in appearance. At first look, they seem very similar. In fact, until I saw the Grom in the flesh, I was sure that the only difference would be in where the engine was placed. But when you look at the two side by side, a lot of differences begin to stand out. The first, of course, is that gaping hole where the engine should be. Then you realise that a lot of the similarity is thanks to the colour themes. Take that away and they are completely different. 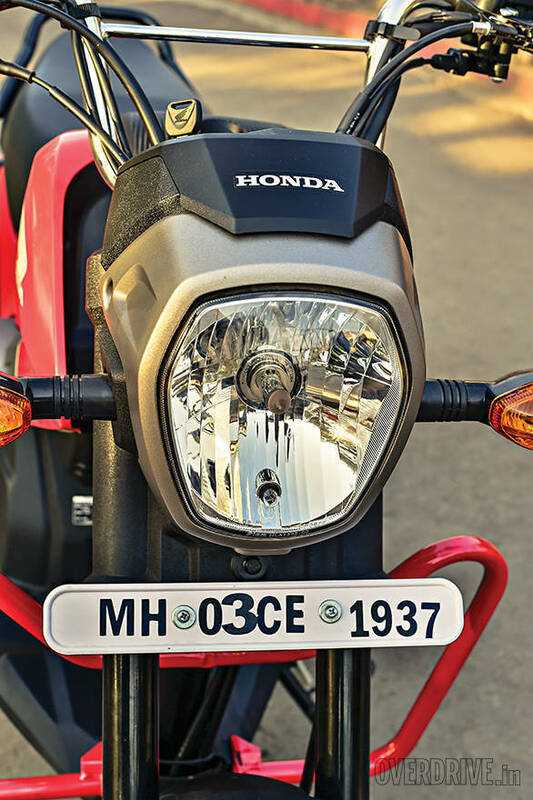 The headlight is larger, the forks are beefier, the rear gets a swingarm and chain drive, the handlebar is more motorcycle and less moped, and the wheels aren't unimaginative steel numbers. 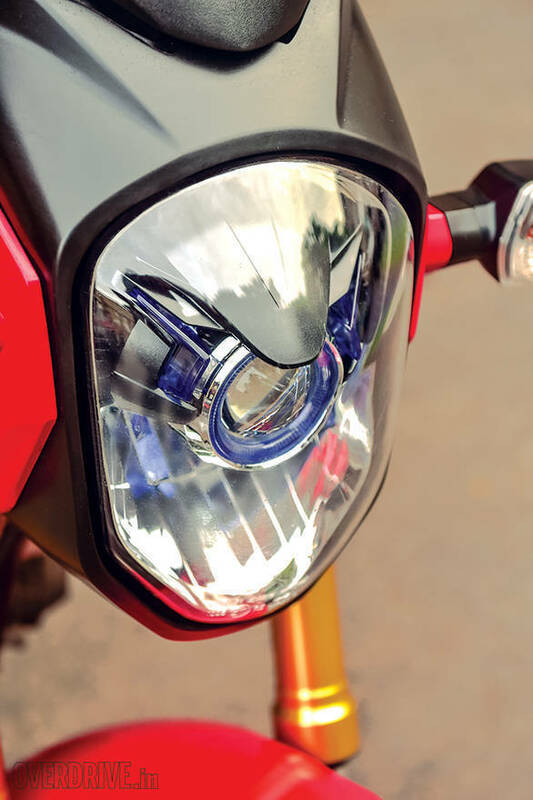 In fact, where the Navi looks like an oddity, the Grom looks exactly like a scaled-down motorcycle. Next, the little voice wanted to compare specs. So I did. One is a proper motorcycle with some top-spec bits while the other is a scooter at its heart. 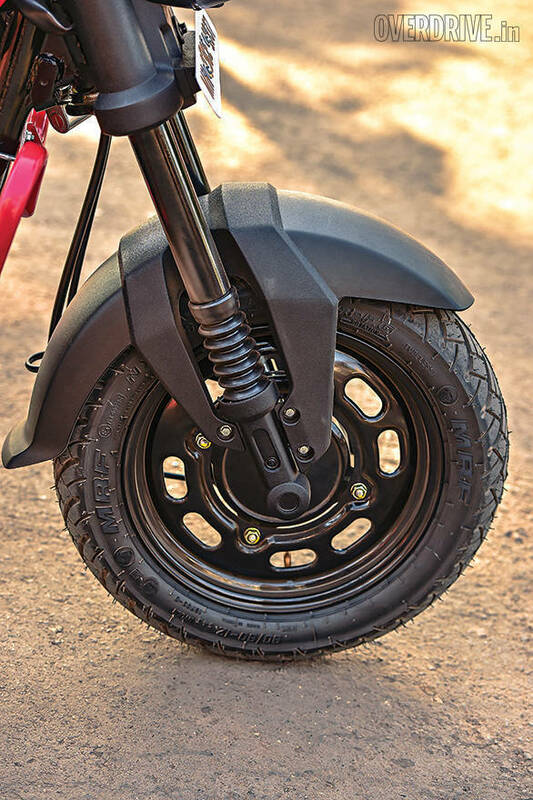 The Grom uses a 125cc air-cooled single that is fuel injected and built around a single steel tube backbone frame with an upside-down fork, a monoshock and disc brakes at both ends. 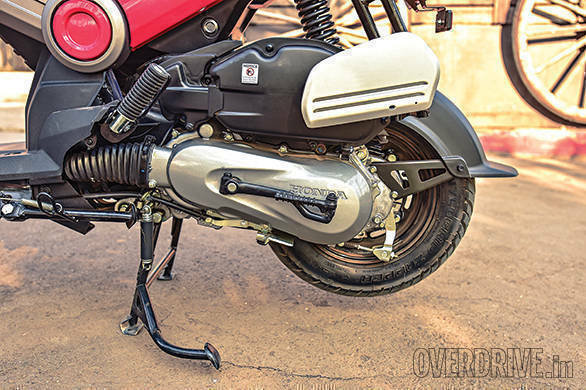 The Navi uses the Activa's 110cc motor in a similar frame with an upside-down fork up front, a hydraulic shock at the rear and drum brakes at both ends. 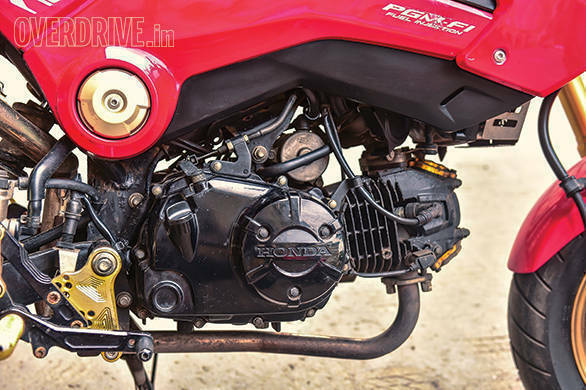 And let's not forget the biggest difference  the Navi uses a variomatic transmission while the Grom gets a proper 5-speed gearbox. The gearbox is what creates the biggest difference in feel too. 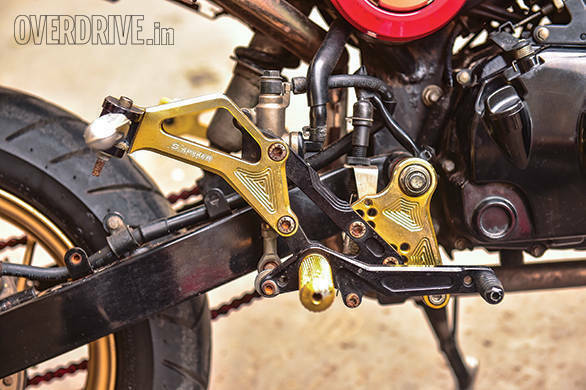 Of course, the slightly rearset footpegs (the ones on the bike we rode are aftermarket units that are super rear set while the stock ones are about a foot less extreme), the more upright seating and the slightly larger size add to this. But as I said before, the gearbox is what actually makes them feel different. 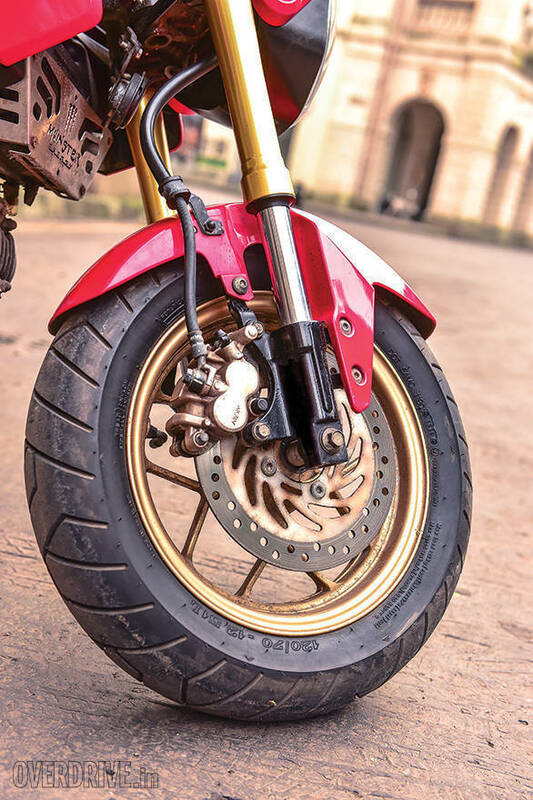 You realise this the moment you hop back on the Grom from the Navi, and your feet start feeling around for control levers the moment you want to slow down or overtake. In rare cases, you might even lock up your rear when trying to pull the clutch in. Don't ask how I know. They also feel different to ride too. The Grom feels more like proper motorcycle in the way it handles. It doesn't feel over eager to turn in and feels a lot more stable than the Navi. 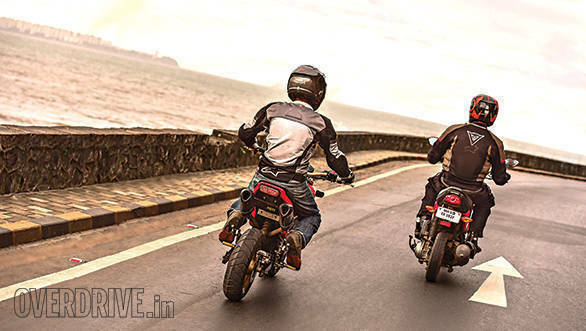 However, the big difference is that while the Navi lets you pull a lot of mischief, the Grom goes one step further. Let me explain. The Navi, at its heart, still feels like a scooter to ride. The small wheels and short travel front forks and hydraulic rear forks limit the amount of fun you can have with it? What on earth am I talking about? With the Navi, you can slide your rear out and jump over speed breakers. But the moment you land, you get to know exactly why suspension travel is important. 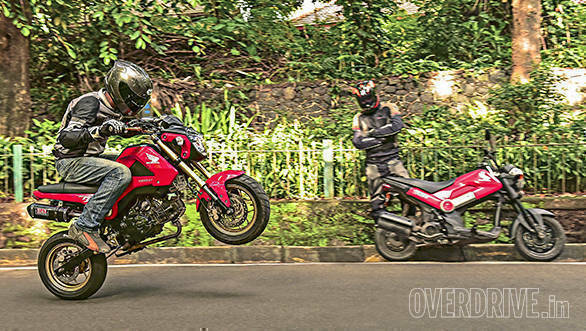 Meanwhile, the Grom lets you pull wheelies, powerslide around wet roads (again, don't ask how I know), pull stoppies and jump over speed breakers with large amounts of air underneath. It takes all the fun that the Navi is capable of and multiplies it by 10. And then you can multiply it further with aftermarket hooliganism. You can slap on a dinner plate rear sprocket and create a wheelie monster. You can put an extended swingarm on it and create the sort of thing you'd find in a 50-cent riding. You can mess about with the ECU, exhaust, brakes and suspension to create a go-kart trackday hooligan. The possibilities are endless. Both these motorcycles are immense amounts of fun. They are mischief enablers of the highest order. However, I just have to say that the Grom is just a bit more mischievous in all the right places. But then the Navi has a trump card that tips the scales in its favour a great deal. You can walk into a Honda showroom right now and get yourself one. And isn't that the kind of mischief that is best? The kind that you can actually indulge in and get away with. We'll just have to manage with mischief that doesn't involve wheelies and stoppies till then.